Vulnerable Rohingya refugees living in makeshift camps in Bangladesh now face further disaster, as monsoon rains are causing floods and landslides and increase the risk of deadly disease. Oxfam is racing against time to improve hygiene, sanitation and water delivery, and prepare families in the face of the storms. You can help. Close to a million Rohingya people have fled unimaginable atrocities in Myanmar to seek refuge in Bangladesh. They are now squashed into an area far too small to safely accommodate them, living in makeshift tents in hugely overcrowded settlements, on unsuitable steep land. Conditions are dire, with overflowing latrines and contaminated water, and bad weather will make matters worse. The heavy rains have caused damage and injuries throughout the camps, cutting access to large parts and requiring emergency relocations of refugees to other areas. There’s a high risk of a major outbreak of disease. During the monsoon season, around 2.5 meters of rain will fall in three months, turning camps built on dusty soil into unhealthy swamps, and making it very difficult to get aid to people. Hundred of thousands of refugees are living in flimsy shelters that can be washed away by floods or landslides, made of tarpaulin and bamboo and unable to withstand major storms. Heavy rains make footpaths that refugees rely on to collect water and food, and go to the toilet, totally unusable. It’s estimated that half a million people could struggle to get vital aid and services during the monsoon, with women most at risk. 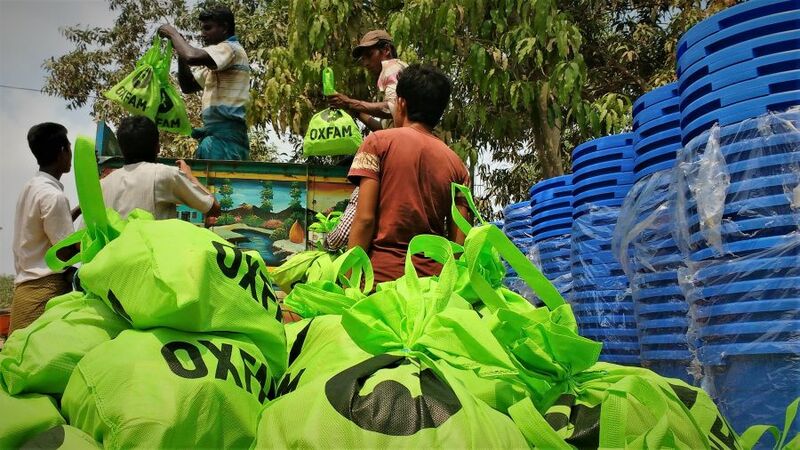 Since September, Oxfam in Bangladesh has provided emergency relief to 266,000 people. Our priority now is to help refugees brace for the monsoon season. We are working to prevent waste escaping from latrines and have emergency supplies like water pumps and toilets in our warehouses ready, if storms damage water points and other infrastructure. We are providing water and hygiene supplies to contain the spread of disease, and helping families understand how to stay safe and healthy. We are currently providing nearly 240,000 liters of safe drinking water per day to 25,500 people in Unchiprang camp. In the southern Teknaf camp we have built a large ground water treatment plant that is providing around 385,000 liters a day. We have cleaned out and repaired hundreds of latrines, constructed 770 bathing cubicles and installed 726 wells which help to prevent water being contaminated after a heavy rain fall and leading to an outbreak of disease. We have distributed more than 21,500 hygiene kits so far and have recruited more than 550 Rohingya volunteers to conduct hygiene sessions on safe water, latrine cleanliness, food hygiene, handwashing, and diphtheria awareness. Hundreds of Rohingya refugees are still arriving every week in Bangladesh, joining close to a million already living in severely crowded and unhealthy conditions. More aid and more resources are needed to cope with deadly monsoon rains and improve conditions in the camps for as long as the Rohingya need supports.